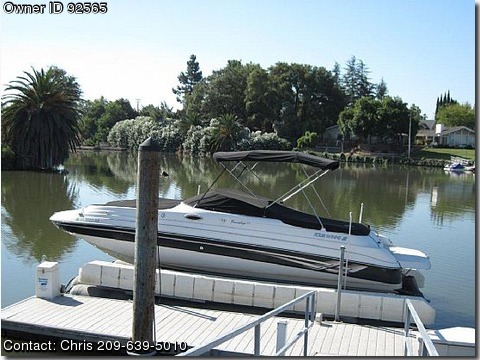 Our 2001 Four Winns is a great boat to take out up to a dozen good friends for a day cruise, This boat has a great layout and many convenience features. LAYOUT: The open bow and seat design will allow your guests to seat comfortably or walk around, The snap out carpet will keep their feet from getting hot, The bimini top provides shade for the middle of the boat, The 2 captains chairs swivel, The boat has drink holders galore and 2 built in ice chests that stay out of your way, Table can be removed and stored.The boat is also equiped with a sink and head, so you have all of the conviences of home on the water. It's really easy to board from the rear extended swim platform if you are stern tied, or a door on the starboard bow side of the boat. you can also board from the bow, If you are in the water, both the bow and stern have drop down ladders and a fresh water shower to clean up. Lots of storage under all of the seats, also a long compartment under the bow floor to keep skis, wakeboards,etc out of sight, There is a lined center floor compartment with drain that can handle the catch of the day if you are a fisherman. POWER- the 5.7 GSI will get the boat on plane fast, and can easily pull skiers,boarders, or inner tubes, The outdrive is a Volvo Penta with the douprop stainless blades, it will max out at about 50MPH depending on your load. We have only logged 110 hours on our boat.We have always stored our boat out of the water on our hoist, so there is no electrolysis and scum buildup on the hull. The water impeller gets changed annually, and last year the boat got a new fuel pump. CONVIENENCE-The boat is equipped with a factory AM/FM/ CD player and 4 speakers so youcan enjoy your music. Auxillary stereo controls on the swim platform. The bow converts to a sunbathing area wih the additioal cushons. The helm has a cushion grip steering wheel and wood grained dash with all of the gauges easily visible. Also equipped with 2 bow headlights for night docking and cockpit lights throughout if you are out at night. EXTRAS-The trailer just had the bunks reupholstered last summer, I am also including: a full boat canvas cover ( used 1 year), bow and stern anchors,water ski, life jackets, inflatable, ski flag, Just add gas and ice to go out and have a great time!